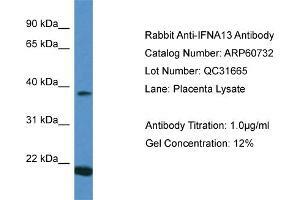 Characteristics This is a rabbit polyclonal antibody against IFNA13. It was validated on Western Blot. Background IFNA13 is produced by macrophages, IFN-alpha have antiviral activities. Interferon stimulates the production of two enzymes: a protein kinase and an oligoadenylate synthetase.